I have had a difficult time getting back to this blog.... I enjoy writing and sharing Owen with anyone who will read this, but the last post I did about the day we found out we lost him was extremely draining. Then came the holidays... and in the midst of that Owen's headstone was set at the cemetary. I think that was the hardest day yet. It's just so final. I had a much harder time handling that than I thought I would. I am continually reminded of God's grace through all of these trials. He has not left us without hope and without comfort. He has reminded us that we are not forgotten during this time through so many prayers, cards, emails, texts and messages from friends and family. In the flood.....We are so thankful! So, I wanted to take some time here and share some of those things that are shareable with you. I found such comfort in words, in quotes and in songs. 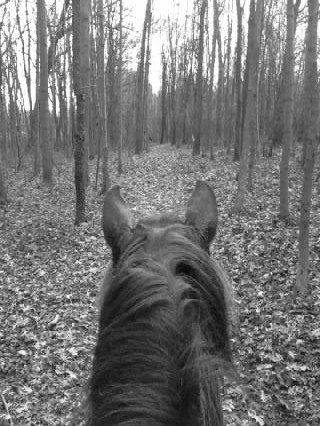 Any of you who have known me at all, for any length of time would know that I LOVE horses. Most little girls at one point or another go thru a some sort of horse obsession stage. I just never "grew" out of it. In fact, when I graduated college, the first thing I bought was a horse. An unbroke, unrideable mare named Attitude. 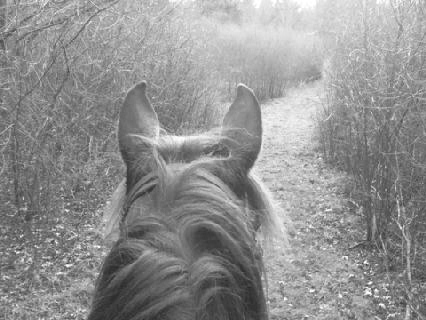 It was ridiculous and frivolous and not very wise but I loved that mare! What I really needed was a new car, but I bought a horse! 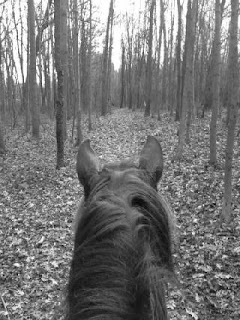 I broke her to saddle and spent countless hours with her. When Derek and I got married, I sold her and she helped finance our honeymoon. (Finally! Something a little smarter!) Fast forward about 2 years or so and my girlfriend, whom I providentially met thru Attitude, had moved her horses to her own farm where she was breeding and training and she had a little red fireball colt that she was not terribly interested in holding onto. So, of course.... I wanted him! It took a little convincing, but Derek finally gave in. How long can a girl be without a horse after all?? Malachi has been a part of our family ever since. As I said before, Christmas was hard this year. I was expecting that, but even expectation doesn't prepare you for reality sometimes. Then in the midst of those moments He will give me a glimpse of eternity.... That is what the quote at the top of this post and the one that follows are. They are glimpses of hope. Of joy. Of thankfulness that He knows better than I. All right. Now I have more from Stepping Heavenward for you... Wisdom from Mrs. Campbell to Helen, but as good as it’s straight to you or to me. And finally, to close this post, here is the third and final installment from Spurgeon's Sermon on Infant Salvation. This is my favorite part of the whole sermon. May you find comfort wherever your are. Truly our hope is in Christ Alone! III. I now come to make a PRACTICAL USE OF THE DOCTRINE. Loses some hours of joy, but months of sorrow. Death restrikes but once, and that stroke doth relieve us." Ordered tomorrow to return to death." So is it. It is well to fight and will, but to will as fairly without the fight! It is well to sing the song of triumph after we have passed the Red Sea with all its terrors, but to sing the song without the sea is glorious still! I do not know that I would prefer the lot of a child in heaven myself. I think it is nobler to have borne the storm, and to have struggled against the wind and the rain. I think it will be a subject of congratulation through eternity, for you and me, that we did not come so easy a way to heaven, for it is only a pin's prick after all, this mortal life; then there is exceeding great glory hereafter. But yet I think we may still thank God for those little ones that they have been spared our sins, and spared our infirmities, and spared our pains and are entered into the rest above. Thus saith the Lord unto thee, O Rachel, if thou weepest for thy children, and refuseth to be comforted because they are not: "Restrain thy voice from weeping, and thine eyes from tears, for thy work shall be rewarded with the Lord, and they shall come again from the land of the enemy." The next and perhaps more useful and profitable inference to be drawn from the text is this: many of you are parents who have children in heaven. Is it not a desirable thing that you should go there, too? And yet have I not in these galleries and in this area some, perhaps many, who have no hope hereafter? In fact, you have left that which is beyond the grave to be thought of another day, you have given all your time and thoughts to the short, brief, and unsatisfactory pursuits of mortal life. Mother unconverted mother, from the battlements of heaven your child beckons you to Paradise. Father, ungodly, impenitent father, the little eyes that once—looked joyously on you, look down upon you now, and the lips which had scarcely learned to call you father, ere they were sealed by the silence of death, may be heard as with a still small voice, saying to you this morning, "Father, must we be for ever divided by the great gulf which no man can pass? "Doth not nature itself put a kind of longing in your soul that you may be bound in the bundle of life with your own children? Then stop and think. As you are at present, you cannot hope for that; for your way is sinful, you have forgotten Christ, you have not repented of sin, you have loved the wages of iniquity I pray thee go to thy chamber this morning and think of thyself as being driven from thy little ones, banished for ever from the presence of God, cast "where their worm dieth not and where their fire is not quenched." If thou wilt think of these matters, perhaps the heart will begin to move, and the eyes may begin to flow, and then may the Holy Spirit put before thine eyes the cross of the Savior the holy child Jesus! And remember, if thou wilt turn thine eye to him thou shalt live: if thou believest on him with all thy heart thou shalt be with him where He is,—with all those whom the Father gave him who have gone before Thou needest not to be shut out. Wilt thou sign thine own doom, and write thine own death warrant? Neglect not this great salvation but may the grace of God work with thee to make thee seek, for thou shalt find—to make thee knock, for the door shall be opened—to make thee ask, for he that asketh shall receive! O might I take you by the hand—perhaps you have come from a newly-made grave, or left the child at home dead, and God has made me a messenger to you this morning; O might I take you by the hand and say, "We cannot bring him back again, the spirit is gone beyond recall, but you may follow!" Behold the ladder of light before you! The first step upon it is repentance, out of thyself the next step is faith, into, Christ, and when thou art there, thou art fairly and safely on thy way, and ere long thou shalt be received at heaven's gates by those very little ones who have gone before, that they may come to welcome thee when thou shouldest land upon the eternal chores. Yet another lesson of instruction, and I will not detain you much longer. What shall we say to parent who have living children? We have spoken of those that are dead, what shall we say of the living? I think I might say, reserve your tears, bereaved parents, for the children that live. You may go to the little grave, you may look upon it and say, "This my child is saved; it resteth for ever beyond all fear of harm." You may come back to those who are sitting round your table, and you can look from one to the other and say, "These my children, many of them are unsaved." Out of God, out of Christ, some of them are just ripening into manhood and into womanhood, and you can plainly see that their heart is like every natural heart, desperately wicked. There is subject for weeping for you. I pray you never cease to weep for them until they have ceased to sin, never cease to hope for them until they have ceased to live; never cease to pray for them until you yourself cease to breathe. Carry them before God in the arms of faith, and do not be desponding because they are not what you want them to be. They will be won yet if you have but faith in God. Do not think that it is hopeless. He that saved you can save them. Take them one by one constantly to God's mercy-seat and wrestle with Him, and say, "I will not let thee go except thou bless me." The promise is unto you and to your child, even to as many as the Lord your God shall call. Pray, strive, wrestle, and it shall yet be your happy lot to see your household saved. This was the word which the apostle gave to the gaoler, "Believe on the Lord Jesus Christ, and thou shalt be saved and thy house." We have had many proofs of it, for in this pool under here I have baptised not only the father and the mother, but in many cases all the children too, who one after another have been brought by grace even to put their trust in Jesus. It should be the longing of every parent's heart to see all his offspring Christ's, and all that have sprung from his loins numbered in the host of those who shall sing around the throne of God. We may pray in faith, for we have a promise about it; we may pray in faith, for we have many precedents in Scripture, the God of Abraham is the God of Isaac and the God of Jacob, but for this good thing he will be inquired of by the House of Israel to do it for them. Inquire of Him, plead with Him, go before Him with the power of faith and earnestness, and He will surely hear you. One word to all the congregation. A little child was saying the other day—and children will sometimes say strange things—"Papa, I cannot go back again." When he was asked what he meant, he explained that he was here, he had begun his life, and it seemed such a thought to him that he could not cease to be,—he could not go back again. You and I may say the same; here we are; we have grown up, we cannot go back again to that childhood in which we once were; we have therefore no door of escape there. Good John Bunyan used to wish that he had died when he was a child. Then again, he hoped he might be descended from some Jew, for he had a notion that the Hebrews might be saved. That door God has closed. Every door is closed to you and me except the one that is just in front of us, and that has the mark of the cross upon it. There is the golden knocker of prayer: do we choose to turn aside from that to find another,—a gate of ceremonies, or of blood, or of birth? We shall never enter that way. There is that knocker! By faith, great God, I will lift it now. "I, the chief of sinners am, have mercy upon me! "Jesus stands there. "Come in," saith he, "thou blessed of the Lord; wherefore standest thou without?" He receives me to his arms, washes, clothes, glorifies me, when I come to him. Am I such a fool that I do not knock? Yes, such I am by nature—then what a fool! O Spirit of God! make me wise to know my danger and my refuge! And now, sinner, in the name of him that liveth and was lead, and is alive for evermore, lay hold upon that knocker, lift it, give it a blow, and let your prayer be, ere thou leanest this sanctuary, "God be merciful to me a sinner!" May the Lord hear and bless, for his name's sake! Hey Catherine...Just wanted to stop in and say hi! I was also wondering if you were the one who put the cute Valentine's day balloons at the cemetery. Elle, Owen and Penny all had one. If it was you, thank you! It was adorable and made our day. :) We hope you guys are doing well, we know his half birthday is coming up soon. This winter has been a tough one but God is good, as always! Have a good day in Jesus, Catherine!